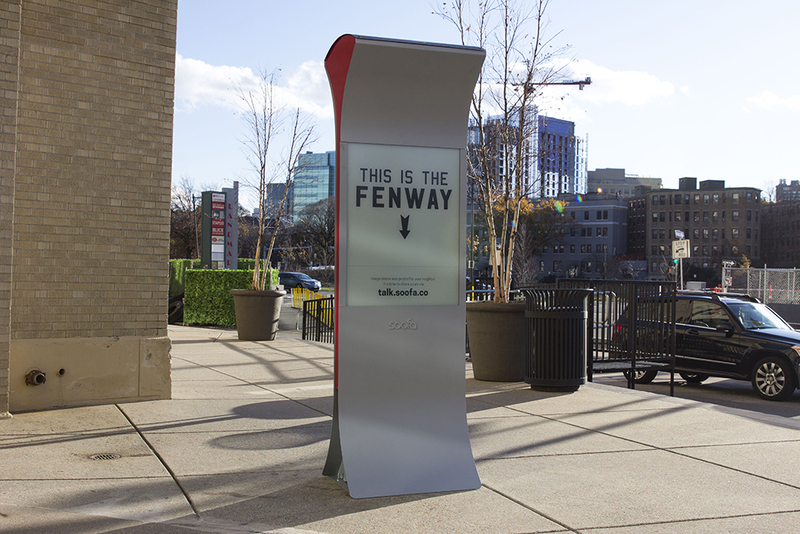 Boston, MA The Fenway will now be home to one of the world’s first solar-powered digital information boards through a new collaboration between Samuels & Associates and Soofa. A 21st century version of the bulletin boards seen in local coffee houses and community centers, the Soofa Sign is a solar-powered, Internet-connected sign with a digital display that provides real-time info to passersby about public transit and local events. Fully open and accessible, the public can post content by logging in through a web-based application, much like they would on a social media platform. This method allows visitors and residents to take over neighborhood communication in a way that’s never been seen before. “When selecting the first neighborhood in Boston-proper to be a site for the Soofa Sign, The Fenway stood out as an obvious choice. With such a unique identity and so many different community voices to highlight - from students and tourists to newly settled young professionals and longtime neighborhood residents - The Fenway is well-positioned to maximize the value of the Soofa Sign as a platform where all people can share what’s happening to bring neighbors together,” said Sandra Richter, co-founder and CEO of Soofa. The three Soofa Signs will be located around Fenway: one at the corner of Van Ness and Kilmarnock, a second on Boylston St. by Sephora, and a third at 401 Park outside of REI. “Without the support and engagement of our Fenway neighbors, we would not have been able to succeed in our vision of transforming The Fenway into the dynamic and vibrant area it is today. We are thrilled to be able to support unique and innovative ways for our community to share important news, events, and opportunities to get to know each other, as well as the places where they live, work, shop and play,” said Sabrina Sandberg, Vice president of marketing and merchandising at Samuels & Associates. Signs can feature anything from a new gallery opening at one of the neighborhood’s art museums, an upcoming concert at The House of Blues, new offerings from a local restaurant, a pop up event at a nearby retailer, to a local artist’s latest piece or a happy birthday wish to a significant other. Soofa, which is officially incorporated under the name Changing Environments, was founded in 2014 as a product of the MIT Media Lab. Today, Soofa is still headquartered out of Cambridge, Mass., and has products present in over 100 cities across the country. In addition to interactive signs, the tech company also launched solar powered benches with USB charging ports and embedded sensors that measure how popular outdoor spaces are. Soofa, headquartered in Cambridge, MA and started at the Massachusetts Institute of Technology (MIT), develops loveable technology to enable smarter placemaking. Founded in late 2014 by three female engineers, Soofa has deployed smart urban furniture in 100+ cities across the United States. Soofa’s flagship solar powered park bench charges phones and allows owners to activate and understand their spaces. The recent launch of their second product, the Soofa Sign, an off-grid digital community bulletin board furthers their mission to create urban ecosystems that inspire.